Semiconductor Research Corp. (SRC) recently chose a team of researchers from Binghamton University and Purdue University to lead a new multimillion dollar research center. The Center for Heterogeneous Integration Research in Packaging, or CHIRP, will help to define the future of electronics packaging in the United States and globally for the next decade. Moore’s Law — the observation that the number of transistors in an integrated circuit doubles about every two years — held steady for 50 years. Due to increased integration, along the way, consumers became accustomed to steady reductions in the cost of computing. That trend cannot continue without some significant changes in thinking; transistors simply can’t get much smaller than they already are. That’s where CHIRP comes in. 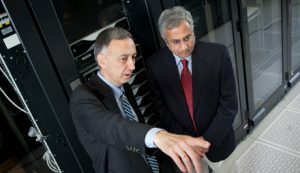 Ganesh Subbarayan, professor of mechanical engineering at Purdue, developed the winning proposal with Bahgat Sammakia, vice president for research and a distinguished professor of mechanical engineering at Binghamton; and Kanad Ghose, professor of computer science at Binghamton. Subbarayan and Sammakia will serve as co-directors of the center, whose research will address issues in global interconnects, efficient power delivery, system design, thermal management, novel materials, reliability, and other topics. Heterogeneous integration of many microchips into single packages will be essential to technology ranging from cell phones to mainframe computers for at least the next decade, Sammakia says. Purdue and Binghamton have a history of collaboration that stretches back nearly two decades. Roughly a dozen faculty members in engineering and computer science at the two institutions will participate in the center’s research. The center expects to expand in faculty participation as SRC initiates additional projects. Semiconductor Research Corp., a world-class technology research consortium, promotes collaborations among academic institutions, technology companies and government agencies. It will provide $1.8 million to the center in the first four years; another $1.8 million will come from the campuses, the State University of New York and other sources. CHIRP will enable the Purdue and Binghamton researchers to expand their existing work, much of which has been federally funded, into products and applications. The founding members of SRC’s CHIRP are ARM, IBM, Intel, NXP, Texas Instruments and Samsung, which will guide the research at Purdue and Binghamton.